Home » Lifestyle » Health & Wellness » IMPC Cares: The Mediterranean Diet: Heart Healthy Food Your Stomach Will Love! IMPC Cares: The Mediterranean Diet: Heart Healthy Food Your Stomach Will Love! Healthy fats, whole grains, fruits and vegetables are key to the Mediterranean diet. Typically, the Mediterranean diet is used as the Gold Standard diet for those seeking to improve their heart health. By heart health, we mean lowering your “bad” LDL cholesterol, improving blood pressure and decreasing risk of heart attack and stroke. However, new research is coming out showing that following the Mediterranean diet shows promising benefit in preventing all types of cancer, Parkinson’s disease, and Alzheimer’s disease! Just think- so many health benefits all while enjoying delicious, fresh food! 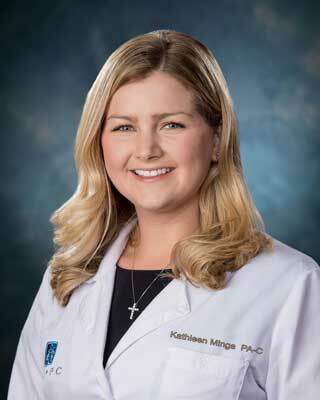 Katie Minga, PA-C, Internal Medicine and Pediatric Clinic, New Albany, MS.
• Eating mostly plant based foods in their original form. This includes wholes grains, legumes (beans and peas), fresh fruits and veggies, and nuts. • Using healthy fats like olive oil instead of less healthy fats like butter and margarine. • Using fresh spices and herbs to flavor your food, instead of salt. • Eating poultry (chicken & turkey) and fish two or more times a week. • Eating red meat (lamb, pork and beef) no more than twice a month. • Eating with friends and family and making an event out of a meal, rather than eating quickly by yourself. • As with any healthy lifestyle plan, you should always strive to get plenty of exercise. • If you enjoy red wine, this diet plan also allows 5oz of red wine a day for women and 10oz a day for men. However, if drinking red wine is not something you enjoy, please remember this component is optional! So now that you know the guidelines and the general idea of what the Mediterranean diet is about, here are some easy ways to make healthy changes to your current diet. Remember, drastic changes will not last for long, so make small, intentional changes with each trip to the grocery store and before you know it you will be on your way to heart health! • Going out to dinner? Choose a fatty fish (tuna or salmon) that is grilled or baked, rather than a steak or hamburger. Also, if there is bread on the table, ask for some extra-virgin olive oil to dip it in, rather than using butter. • Needing a snack throughout the day? Pack some unsalted or lightly salted almonds, cashews, walnuts or pistachios for an energizing snack full of healthy fat! Keep daily nut intake to a handful or less. • Try to get 7-10 servings of fresh fruits and veggies each day. Try to opt for veggies that are baked, grilled or steamed, rather than fried. If you are eating away from home, ask the restaurant to substitute side dishes like mac and cheese and fries with steamed or grilled veggies. • When at the grocery store, start in the fresh produce section and work your way around the perimeter of the store. Choose brightly colored, fresh produce you are excited to eat! Stay away from the middle of the grocery store, where less healthy, processed foods are usually located. • Involve your whole family! If you have children, let them participate by picking out produce they want to try, helping with meal preparation, and sitting down to eat as a whole family. Spend time together at your meals. This is great not only for your heart health, but for the well being of your entire family! • Feeling stuck? Make a wellness appointment at IMPC to talk to one of our providers about how to implement the Mediterranean diet and other healthy changes into your life! Source: www.mayoclinic.org This is a great resource if you would like to explore more healthy lifestyle changes to implement for you and your family!